According to the COO of RXBar in his presentation at the inaugural Groceryshop conference, Gen Z’s favorite meal of the day isn’t really a meal at all — it’s snacks. Snacking is becoming a truly disruptive force for food brands, adding to the competition for space on consumers’ plates. A study from The NPD Group, published in 2017, indicates that 24% of snack food consumption happens during mealtimes. This generally occurs either in the form of supplementing a small meal with a snack (eating a yogurt with a light sandwich, for example) or by combining several snacks together to create a complete meal, either at once or at different points throughout the day. This last point in particular has helped the growth of more filling, nutrient-rich snacks, and has allowed for traditional food companies to reimagine some of their products as alternative snacks. 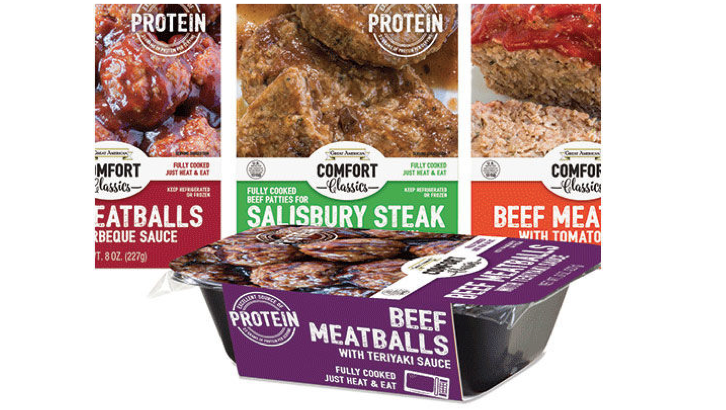 American Food Group’s “Great American Comfort Classics” line, for example, is comprised of an array of small-portioned meat dishes served in microwavable trays. The packaging emphasizes the fact that the dishes can be eaten on their own as a snack, unlike similar products, which would typically be paired with a grain or vegetable to create a complete meal. Additionally, the Better-for-You category has become increasingly crowded with snacks, with brands relying on confusing terminology that is either too technical or too vague. Shoppers have become wise to the fact that words like “natural” are essentially meaningless, but many of them also don’t know what to make of callouts that claim that the product has benefits like being “rich in Omega-3”. As such, Gen Z and millennial consumers have come to value snacks that possess product attributes that make clear sense to them with their current nutrition education. Protein, for example, is now a highly sought-after feature in snacks. This is largely due to certain macro food trends like the keto diet, which demands that participants include a large amount of protein and fat into their diets, while eliminating carbs. This chart comes from Mintel, a global market research firm. 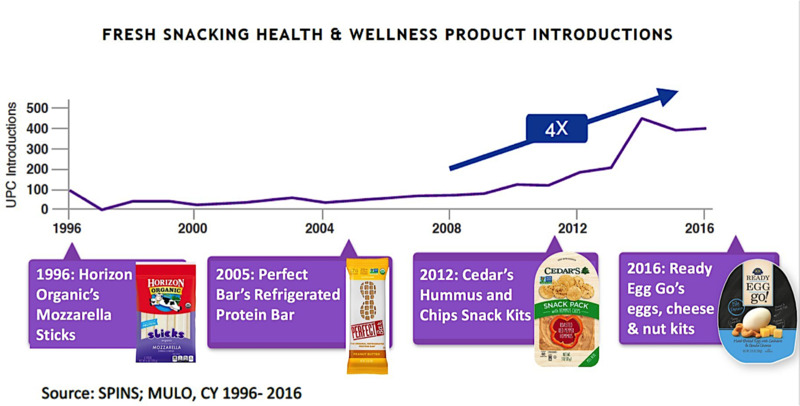 According to their findings, the introduction of products that could be categorized as fresh health and wellness snacks quadrupled between 2008 and 2016, in response to increased market demand. Research from The Center for Generational Kinetics indicates that millennial parents in particular are also very conscious of purchasing BFY snacks for their children, and 55% of millennial moms said that their child was more likely to choose a BFY snack over another packaged snack option. Snacking – particularly BFY snacking – is presenting both an opportunity and a challenge to food brands. Many of them would do well to retool their existing products to create a leaner, more portable line, and they also have to be wary of how competitive that space is becoming. The reality of the traditional American meal is changing – and is, in a sense, at risk of disappearing – and brands will need to closely watch the snack category to understand what they can expect.